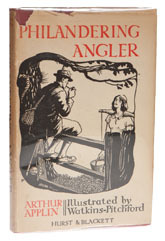 This is one of those books which begins with a picture of a man and a maid and ends with said fellow relaxing in a chair with his pipe, but forgive it because it comes from a gentler age (1942, I think), when such things were less open to misinterpretation and the country was healthily engaged in bombing the blazes out of our European neighbours. It originally cost twelve shillings and sixpence and to tell the truth there isn't much philandering in it. Well any. Quite how such a classic book happened to be written in such distracting circumstances, I do not know, but you can still get copies if you hunt around. Mine cost me forty five quid, but I am sure that the odd one is lurking in a dark corner of a little country bookshop and my stern suggestion is that the minute your fingers close around its spine, it should be your prisoner, because D. Watkins-Pitchford did not illustrate this one by accident and no angling library should be without it. My thanks to Rick Keam for leading me to it, because despite the fact that Mr. Applin managed to write one hundred novels, I was completely unaware of his existence and my life would have been poorer without reading him.